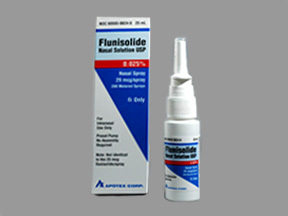 This is a nasal spray for allergy treatment that is also known under the names of nasalide, aerobid and also aerobi-m. It is most often prescribed for persons in need of long-term treatment to control and also prevent any symptoms from asthma. Flunisolide contains an anti-inflammatory steroid that is used as a medication for helping to reduce or eliminate a need for any other corticosteroids. As a form of nasal spray used to relieve hay fever it comes in the version known as nasalide. The main intention of this medication is to reduce the likelihood of possible asthma attacks. However, it will not help with an asthma attack already in progress. There may be other medications more suited to that type of help. Thus its primary value is as a preventive measure and should be taken on a regular basis. And it can take several weeks before one truly notices that it has been helpful. Thus one should be sure to follow the doctors prescribe usage and not change it without his or her permission. Plus one should be sure to check with the doctor or pharmacists if for any reason the instructions are not clear or in anyway confusing. It is also very important that a person take time to rinse out the mouth with water after each use. This will reduce the problem of possible hoarseness, throat irritation or a mouth infection. One’s asthma problem should be stabilized before beginning to use the type of medication. And if one is using a steroid medication the doctor will make any alterations in its usage as needed. This will all be something to review with one’s doctor before using Flunisolide. And if there are any problems the patient should also notify the doctor right way. Care and storage of the medication should be in a place that is away from heat or cold. If one experiences any difficulties with the product they should be directed to one’s health care provider or the pharmacists. And this product is one that should only be use in the correct dosage. As a medication it is not known if it will harm unborn babies. However, it has been shown to cause birth defects it test animals. A doctor’s approval should be obtained before it being used by either pregnant woman or nursing mothers. As with any such type of medication the patient should be careful to observe any symptoms related to the need for the product. One might experience things such as nasal congestion, postnasal drip, sneezing, itching of the throat and even some eye symptoms. These can all take up to four weeks to notice any improvement in the problem. If one doesn’t notice any improvement in one’s condition or the symptoms get worse then one needs to notify the doctor right away. And to be sure that if one has any concerns or problems with the medication to let one’s health care provider know immediately. It is always better to check with the doctor than risk having a problem that could get worse. There are several possible side effects that one might experience from using Flunisolide. These can include nasal irritation and itching, increase cough, nausea or vomiting, nasal burning, bloody nasal discharge or nasal dryness. There may be other possible effects one might experience other than listed above. It is important to check with one’s doctor in order to get a complete list of potential side effects. And if one has any specific concerns on how using this medication might cause problems they need to be directed to one’s health care provider. He or she will be able to respond to anything that occurs from the usage of this medication. Then to be able to also provide any additional information that might be needed about the medication.